To Cite: Mohammadi V, Khorvash F, Feizi A, Askari G. Does Alpha-Lipoic Acid Comsumption Improve Lipid Profile In Patients With Stroke? A Randomized, Double Blind, Placebo-Controlled Clinical Trial, Iran Red Crescent Med J. 2017 ; 19(8):e58765. doi: 10.5812/ircmj.58765. Background: Having a stroke, which is a devastating condition, is a major cause of deaths worldwide and is also accountable for long time disability with high personal and social cost in adults. Hyperlipidemia plays an important role in atherothrombosis, which is the precursor to stroke. One way for decreasing the risk of a stroke is treatment of dyslipidemia. Alpha-lipoic acid (ALA) is an eight-carbon, sulfur-containing compound with antioxidant properties and effective in protecting against hypercholesterolemia and hepatic fat accumulation. Objectives: We designed this trial to scrutinize the possible effects of ALA consumption on lipid profiles in patients who experienced a stroke. 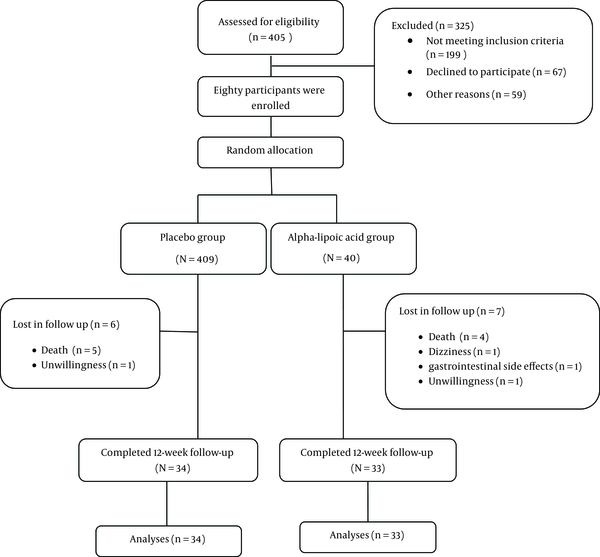 Methods: In this randomized, double blind, placebo-controlled clinical trial, 67 patients who experienced a stroke were randomly allocated into 2 groups (taking a 600 mg ALA supplement or placebo daily for 12 weeks). The triglyceride (TG), total cholesterol (TC), LDL-cholesterol (LDL), and HDL-cholesterol (HDL) were measured and LDL-cholesterol/ HDL-cholesterol (LDL/ HDL) as well as total cholesterol/ HDL-cholesterol (TC/ HDL) were calculated before and after intervention in this study. Dietary intake and statistical analyses were carried out using the N4 and SPSS16 software, respectively. Results: Primary features were similar in the intervention and placebo groups (P < 0.05). After the intervention period, serum levels of TG (123.21 ± 49.63 vs. 152.97 ± 58.83) (P < 0.001), TC (148.67 ± 37.71 vs. 174.35 ± 36.86) (P < 0.001), and LDL (85.09 ± 23.81 vs. 107.56 ± 31.73) (P = 0.002) decreased, and HDL level (58±9.33 vs. 42.97 ± 8.07) (P < 0.001) increased significantly in ALA group compared with the placebo. In addition, LDL/ HDL (P < 0.001) and TC/ HDL (P < 0.001) reduced significantly. Conclusions: Results of this trial indicated that 12 weeks of supplementation with 600 mg alpha-lipoic acid has beneficial effects on lipid profile (TG, TC, LDL, HDL, LDL-/HDL, and TC/HDL) in patients who have experienced a stroke. Thiocitic acid called alpha-lipoic acid (ALA) is an eight-carbon compound containing sulfur. Traditionally, it is recognized as a cofactor in the multienzyme complexes that are responsible for the oxidative decarboxylation of α-ketoacids (1). A general agreement exists regarding the antioxidant properties of ALA, which is thought to function by clearing free radicals directly, chelating metallic ions, enhancing intracellular glutathione (GSH), and activating endogenous antioxidant systems (2, 3). Based on these evidences, ALA is expected to improve inflammatory conditions in the body. Beyond the antioxidant properties of ALA, several studies have reported lipid-modulating effects for ALA through both straight effects and secondary responses related to the anti-appetite properties of this supplement (4-8). ALA reduces body weight and changes other anthropometric indices through increasing metabolism and suppressing appetite (9-13). However, beside these, it is indicated that with no change in energy intake, ALA could protect the liver against fat accumulation as well as hypercholesterolemia (14, 15). Several animal (14, 16) and human (17) studies have investigated possible effects of ALA on lipid profile and indicate various results. Carrier et al. (14) examined the effects of ALA and its mechanism on lipid profile in high fat fed Zucker rats. They observed that ALA could be protective against diet-induced obesity and hypercholesterolemia. In another study done by Maio et al. (16) in 2013, they investigated the effect of ALA on lipid profile in Wistar ovariectomized rats fed a high fat diet for 12 weeks and similar results were seen. Stroke, as a devastating condition, is a major cause of death worldwide and is accountable for long time disability with high personal and social cost in adults (18, 19). The 2012 BRFSS (CDC) data indicated that a history of stroke was seen in 2.9% of people ≥ 18 years of age. In addition, projections show that by 2030, strokes will be experienced by more people and a 20.5% increase will be observed in prevalence from 2012 (20). One of the main causes of a stroke is cerebrovascular atherosclerosis (21) and studies have shown that hyperlipidemia plays an important role in atherothrombosis, which is the precursor to a stroke (22). The relationship between elevated serum lipids and atherosclerosis is well documented and one way for decreasing the risk of stroke is treatment of dyslipidemia (23, 24). Although studying the effects of ALA on cardiovascular risk factors such as lipid profile is not novel, however, studies done in humans are limited and to the best of our knowledge, the beneficial effects of ALA supplementation in patients with stroke have not been investigated by far. Thus, we designed this trial to scrutinize the possible effects of ALA consumption on lipid profile in patients who experienced a stroke. The research ethics committee of Isfahan University of Medical Sciences (IUMS) approved the protocol of this randomized, double blind, placebo-controlled clinical trial (code: IR.MUI.REC.1395.3.068). In addition, we registered this trial protocol in the Iranian registry of clinical trial (IRCT2016051811763N23). Eighty patients who experienced a stroke, who were referred to Alzahra hospital (a referral and governmental hospital affiliated with Isfahan University of Medical Sciences), and met the study criteria were enrolled in this trial (from May 2016 to December 2016). The inclusion criteria included informed consent, thrombotic and embolic stroke, BMI = 18.5-35, age 30 - 70 years, lack of malignancies and specific diseases such as liver disease, kidney disease and cancer based on self-reports, no vitamin, antioxidant and omega-3 supplementation. Exclusion criteria included no collaboration, failure to follow the program of trial (compliance less than 80%), death, and recurrent stroke. We calculate the sample size with power 80% and α = 5% below formula. Thirty-three participants were required for each group, which after considering 20% sample loss, 40 patients in each group were enrolled. We allocated participants randomly (using simple randomization method) into 2 quantitatively equal groups (from a randomized number in an 80-person list in a double-blind parallel manner). We excluded 13 patients during the intervention period due to different reasons; finally, remaining 33 and 34 patients in ALA and placebo groups, respectively (Figure 1). Figure 1. Follow Chart of Participants Throughout the Intervention. We had 2 groups, ALA and placebo. In the ALA group, participants were taking a capsule containing 600 mg ALA supplement 1 hour before or 2 hours after lunch daily. ALA powder was prepared from the Karen Company and capsulated in the School of Pharmacy, Isfahan university of Medical Sciences. We prepared a similar placebo capsule containing wheat flour in the School of Pharmacy, Isfahan university of Medical Sciences and participants used a placebo as an ALA supplement every day for 12 weeks. For blinding the trial, ALA and placebo capsules were completely similar. A person, who was not in the trial process, packed capsules, and encoded them into A and B. Neither researchers nor participants knew about packets content up to the end of the study. We calculated body mass index for each patient (BMI = weight in kg/ht2 in meters). We measured waist circumference at the level of the iliac crest by an Ergonomic Circumference Measuring Tape (model 201; Seca GmbH & Co, KG, Hamburg, Germany). Food intakes were collected by 24-hour food recall by a nutritionist then dietary data was analyzed by the Nutritionist IV software (Version 4.1, First Databank Division, The Hearst Corporation, San Bruno, CA). We measured blood pressure by a mercury sphygmomanometer after 5 minutes of resting. We collected venous blood samples after 12 hours of overnight fasting and after centrifugation, the serum samples were frozen and stored at -70°C. We performed all biochemical measurements in the Laboratory of Biochemistry, Azahra hospital, Isfahan University of Medical Sciences. Serum concentrations of triglyceride (TG) and total cholesterol (TC) were measured by the glycerol 3 phosphate oxidase phenol+aminophenazone (GPO PAP) and the cholesterol oxidase phenol+aminophenazone (CHOD PAP) kit, respectively (Pars Azmoon kit, Iran). The method of measurement of HDL cholesterol (HDL) was spectrophotometry. LDL cholesterol (LDL) was calculated by the Friedewald formula and finally LDL- cholesterol/HDL-cholesterol (LDL/HDL) and total cholesterol/HDL-cholesterol (TC/HDL) were calculated. All needed measurements were repeated when the intervention period finished. All statistical analyses were performed by SPSS (version 16; SPSS Inc, Chicago, IL). Quantitative data are presented as mean ± SD, median, and range. Kolmogorov-Smirnov test (K-S test) was used for checking data normality. In case of normal distribution of data, we used paired t-test to compare variables before and after the intervention within groups. Comparing the variables after intervention, adjusting for baseline values and energy intake were performed by Analysis of Covariance (ANCOVA). All tests were two-sided. We considered P values < 0.05 statistically significant. Primary characteristics were the same in the ALA and placebo groups (Table 1). We found no statistically significant differences in age, weight, height, BMI, Waist circumference, blood pressure, energy and macronutrients intake, and FBS between 2 groups before the intervention (P > 0.05). Within the group analysis, no significant changes were observed in placebo group for all studied variables (P > 0.05), while serum levels of TG (P < 0.001), TC (P < 0.001), LDL (P < 0.001), LDL/HDL (P < 0.001), and TC/HDL (P < 0.001) decreased and HDL level (P < 0.001) increased significantly within ALA group. Based on ANCOVA results statistically significant reductions were observed for serum levels of TG (P < 0.001), TC (P < 0.001), LDL (P = 0.002), LDL/HDL (P < 0.001) and TC/ HDL (P < 0.001) and increment for HDL (P < 0.001) in ALA supplementation group compared with placebo group (Table 2). aValues are expressed as mean ± SD, median and range. cANCOVA adjusted for the baseline value of the variable and energy intake. This study results indicate that 12 weeks of consumption of 600 mg ALA can improve serum levels of TG, TC, LDL, HDL, LDL/ HDL, and TC/ HDL in patients who experienced a stroke. According to our knowledge, the present trial is the first study, which investigated the effect of ALA consumption on lipid profile in patients who experienced a stroke. This study results show a significant reduction in serum levels of TG, TC, LDL, LDL/ HDL, and TC/ HDL, as well as a significant increase in HDL in ALA group compare with placebo. Several animal (14, 16) and human (17) studies have supported these finding even though none of them have reviewed the effect of ALA supplementation on lipid profile in patients with stroke. Consistent with the present study Carrier et al. (14) examined the effects of ALA and its mechanism on lipid profile in high fat fed Zucker rats. In this study, rats were divided to 2 groups (a high fat diet or high fat diet with ALA for 30 days and pair fed to remove confounding effects of anti-appetite properties of ALA). Their results showed that high fat diet with the ALA group was protected against diet-induced obesity and hypercholesterolemia with a reduction in TC, LDL, and total LDL particle number and an increase in total HDL particles. In another study done by Miao et al. (16) in 2013, they investigated the effect of ALA on lipid profile in Wistar ovariectomized rats who were fed a high fat diet for 12 weeks. Metabolic parameters in serum were detected, markedly reduction in body weight, the levels of serum total cholesterol and LDL-cholesterol, as well as increase in the levels of serum HDL were seen. Capasso et al. (17) in a trial, investigated the effects of combination of inositol and alpha lipoic acid in women with metabolic syndrome. In this 6-month, randomized placebo-controlled clinical trial, 155 postmenopausal women with a metabolic syndrome and risk of breast cancer participated. All participants followed a low-calorie diet and were assigned randomly to 2 groups, daily supplementation with combination of inositol and ALA or placebo. Outcomes indicated significant reduction in triglycerides serum levels and improvement in HDL level. Finally, they concluded that daily ALA plus inositol supplementation could improve metabolic syndrome symptoms, significantly. In addition in an animal study, Xu et al. (25) demonstrated which intake of combined flaxseed oil and ALA reduced plasma TG, TC, and LDL, and elevated the ratio of HDL/LDL. Studies indicated that the cholesterol-lowering response of ALA is associated with a decrease in plasma PCSK9 level and an increase in hepatic LDL receptor protein. In addition, ALA protects the liver against TG accumulation via multiple mechanisms including: suppression of lipogenesis (down-regulation of hepatic acetyl- CoA carboxylase and fatty acid synthase expression); increase fat oxidation in liver (enhance carnitine palmitoyltransferase Ia expression); and increase export of VLDL (enhance hepatic diacylglycerol acyltransferase and microsomal triglyceride transfer protein expression and elevate number of plasma VLDL particles) (14, 26, 27). It is also reported that ALA enhances fatty acid uptake and oxidation in muscle tissue and is protective against increasing serum cholesterol and accumulating fat in liver under conditions of strong genetic and dietary predisposition toward obesity and dyslipidemia, without change in energy intake (4, 14). In addition, it has been confirmed that ALA not only plays an important role in preventing fat accumulation (28, 29) it even significantly reduces fat accumulation and appetite by regulating activities of central and peripheral adenosine monophosphate activated protein kinase (9, 12, 30). This has been illustrated that ALA significantly inhibited body weight increase and improved metabolism dysregulation (16, 31). We can mention several limitations for this trial, which is better to be in counted in the interpretation of our results, including restricted duration of the study. In addition, we did not measure lipid particles and apolipoproteins or oxidized particles and total antioxidant capacity. We did not include patients with a hemorrhagic stroke. It seems to be a need for further studies. Beyond these weaknesses, this is the first randomized, double blind, placebo-controlled clinical trial investigating the effects of ALA in patients experienced stroke. In conclusion, based on the results of this trial, ALA consumption (600 mg, 12 weeks) has beneficial effects on lipid profile (TG, TC, LDL, HDL, LDL / HDL, and TC/ HDL) and could be a risk modifier for patients who experienced a stroke. We thank all the volunteers who participated in this study. This study was extracted from a PhD dissertation, which was approved by the school of nutrition and food science, Isfahan University of Medical Sciences (code: IR.MUI.REC.1395.3.068).